Of all of the essential oils, peppermint essential oil is one of the most popular by far. Peppermint essential oil has been used for centuries to treat an enormous variety of common ailments, provide a refreshing scent and even add a minty taste to teas and beverages. Many over-the-counter cough suppressants contain peppermint essential oil because of an ingredient called menthol that naturally exists in the peppermint plant. Menthol has a strong fragrance and when it is inhaled, it is capable of thinning and looesning mucus that is causing the sufferer to cough (source). Additionally, menthol provides a cooling sensation on that with which it comes into contact. By inhaling peppermint essential oil, the cooling menthol can soothe an irritated and inflamed throat. Remove the lid from an empty and clean 10oz plastic bottle. Fill this bottle with a carrier oil that has a thin consistency. Jojoba oil and olive oil work very well for this. Remove the cap from a bottle of peppermint oil. Tilt the bottle so that the top of it is facing the mouth of the bottle that contains the carrier oil. Shaking the bottle of peppermint oil gently, pour about 35 drops into the carrier oil. Place the lid back onto the 10oz plastic bottle. Shake the bottle for about 45 seconds. Whenever you have a cough, pour about one tablespoon of this oil mixture into one palm. Massage your palms together so that the oil is evenly distributed on each palm. Then, massage the oil into the skin of your chest in circular motions. Continue massaging the oil until it has completely absorbed into the skin. One of the most effective ways to relieve gas pain and bloating is to ingest peppermint essential oil. In fact, many popular over-the-counter gas relief medications use peppermint essential oil as their active ingredient. Peppermint calms down muscles along the digestive tract that become tense when they are filled with gas. Once these muscles are relaxed, gas can finally pass through more easily, bringing fast relief to the sufferer (source). Fill a tall drinking glass with water. Twist off the cap of a bottle of pure peppermint essential oil. Tilt the head of the bottle so that the spout is facing the mouth of the glass. Carefully tap the side of the bottle to release four to five drops of peppermint essential oil into the glass of water. Stir the water vigorously for about 20 seconds to ensure that the peppermint essential oil is evenly distributed. Drink the glass of water quickly. Studies have shown that by consuming peppermint essential oil before exercising, you can improve your overall performance. This is the result of a combination of effects that peppermint essential oil has on the body including improved brain function, improved respiratory function, decreased levels of joint and muscle pain and increased blood flow throughout the body (source). About 30 minutes before beginning your workout routine, fill a tall drinking glass with water. Remove the cap from a bottle of peppermint essential oil. Make sure that the oil is pure. Tilt the bottle so that the spout is leaning toward the mouth of the glass of water. Gently shake out about four to five drops of oil into the glass. With a spoon, stir the water for about 20 seconds so that the peppermint oil is mixed into the water evenly. Sip the entire glass of water within a few minutes. The menthol that is in peppermint essential oil can relieve muscle and joint pain. Menthol permeates through the skin and enters muscle and joint tissue, instantly forcing tense muscles and joints to relax. Menthol also has a numbing effect when applied topically. Additionally, it has anti-inflammatory properties as well as a unique ability to open up blood vessels upon contact which allows blood to flow back into the tense muscles and joints (source). Unscrew the cap off of an empty, clean 10oz plastic bottle. Fill the bottle with a carrier oil such as olive oil, jojoba oil or sweet almond oil. Choose a carrier oil that has a fairly thin consistency so that it can spread on the skin easily. Remove the cap from a bottle of peppermint essential oil. With the cap off, tilt the spout of the bottle of oil over the mouth of the bottle containing the carrier oil. Gently shake the bottle of peppermint oil to allow about 20 to 30 drops to fall into the carrier oil. Screw the cap of the bottle containing both oils back on. Shake the mixture with vigor for about 30 seconds to ensure that the two oils are combined. To apply this mixture for pain relief, pour about one to two tablespoons of the oil mixture into your palm and massage the oil into the skin until it has completely absorbed. Because of peppermint’s analgesic properties, peppermint essential oil is a highly effective and fast-acting method for relieving headaches. Studies have confirmed that peppermint oil is an effective alternative to traditional pain relief medications (source). Peppermint essential oil treats tension headaches and migraines by opening up blood vessels while simultaneously numbing the skin upon contact. Additionally, it forces tense muscles to relax. 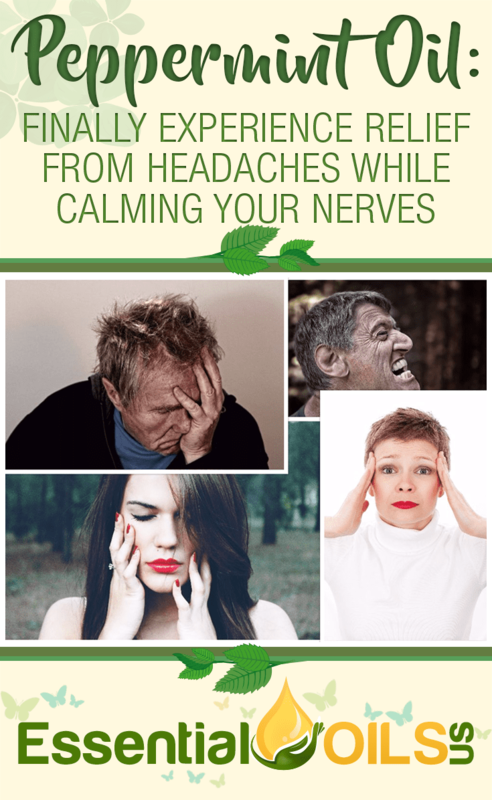 Peppermint essential oil can also treat sinus headaches. The menthol that is in peppermint acts as a decongestant, allowing mucus that is blocked in the sinus passages to move along more easily. Unscrew the cap off of a bottle of peppermint essential oil. Tilt the bottle so that the mouth of it is facing your palm. Carefully tap the side of the bottle with one finger to allow about 6 or 7 drops to fall into your palm. Rub your palms together so that the oil is on both of your palms. In small clockwise circles, massage the oil into the skin of the affected areas. Often, the pain is in the temples or on the forehead. Continue to massage the oil into the skin until it is completely absorbed. Wait for 20 minutes. If you still haven’t experienced relief from your headache, you may repeat this process once more. Unscrew the cap off of the bottle of peppermint oil. Place the bottle of oil directly below one nostril. Take ten deep breaths through your nose. You should quickly begin to feel relief from your sinus pressure. Studies have proven that both the inhalation and ingestion of peppermint essential oil can profoundly reduce feelings of nausea (source). Remove the cap from a bottle of peppermint oil. Position the bottle of oil directly under your nose so that the mouth of the bottle is right under one nostril. Take several deep nasal breaths. Continue doing this until your nausea is gone. Unscrew the cap off of a bottle of peppermint oil. Angle the bottle so that the spout is facing the mouth of the glass. 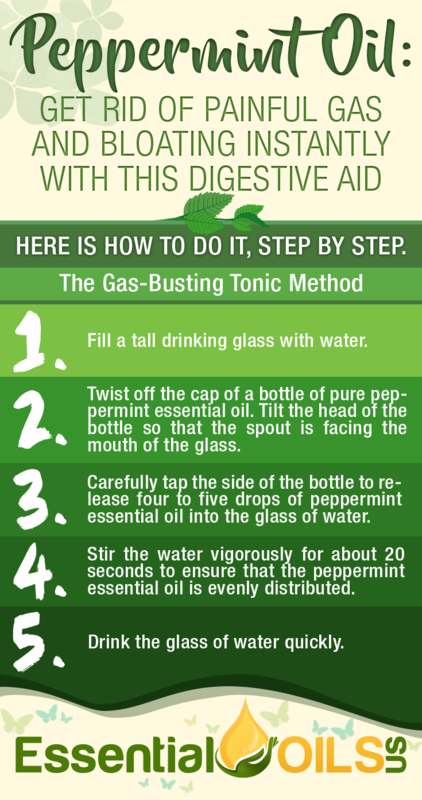 Gently shake the bottle of peppermint oil so that about 6 or 7 drops of the oil are released into the glass. Using a spoon, stir the oil into the water for about 15 seconds. For almost a century, peppermint essential oil has been used in commercial oral hygiene products such as toothpaste, dental floss and mouth wash. Peppermint essential oil’s deodorizing abilities combined with its antibacterial and antiviral properties make it ideal for maintaining a healthy mouth and fresh breath. 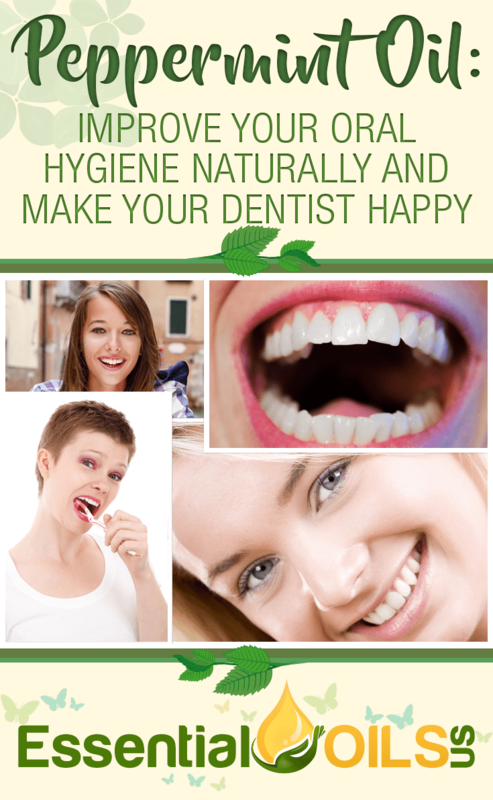 In fact, some studies suggest that peppermint essential oil can kill plaque as effectively as fluoride. This has to do with the antibacterial and antimicrobial properties that exist in the peppermint plant (source). Remove the cap from a 10oz plastic bottle that has been thoroughly cleaned with hot water. Fill the plastic bottle with water. Remove the cap from a bottle of peppermint essential oil. Place the bottle upside down and position it directly over the mouth of the plastic bottle containing the water. Shaking the bottle of peppermint oil, release about 40 to 50 drops of oil into the water. Screw the cap back onto the plastic bottle. Vigorously shake the bottle for about 50 to 60 seconds to ensure that the oil is evenly incorporated into the water. Rinse with this mixture for 30 to 60 seconds twice each day. When you’re ready to brush your teeth, squeeze a small amount of toothpaste onto your toothbrush as you normally do. Remove the cap from a bottle of peppermint essential oil. Tilting the bottle so that the spout is facing your toothbrush, gently tap the side of the bottle with one finger to release two drops of the oil onto the toothpaste. Brush your teeth as you normally do. You may add the peppermint oil to your toothpaste each time you brush your teeth. Peppermint essential oil is a powerful insecticide that keeps away all kinds of indoor and outdoor pests including mosquitoes, ticks and fleas (source). Studies have shown that mosquito larvae that is exposed to peppermint essential oil will die within 24 hours (source). Remove the cap from a 20oz clean plastic spray bottle. Position the bottle of essential oil upside down and directly above the mouth of the spray bottle containing the water. 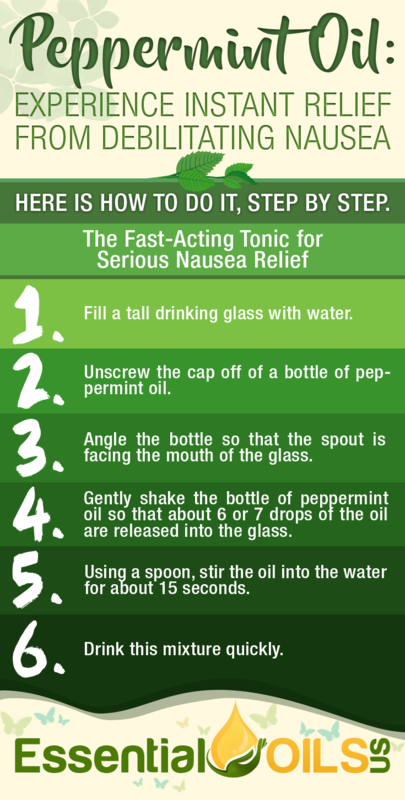 Shake the bottle of peppermint oil so that about 50 drops are poured into the water. Screw the cap back onto the spray bottle. Shake the bottle for about one minute. 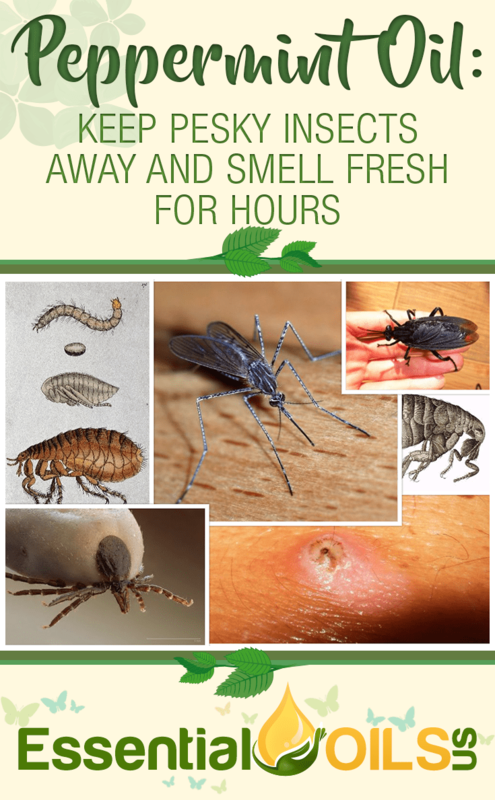 You may use this spray on your body as a bug repellent. You may also spray areas that are vulnerable to insect invasions such as entryways in your home and your outdoor garden. Peppermint essential oil kills head lice. By applying peppermint essential oil to the scalp and leaving it on for at least half an hour, lice will begin to die quickly, allowing you to rinse them out easily under running water. Plus, lice are repelled by peppermint essential oil. Therefore, you can prevent a lice outbreak by using this oil in your hair daily (source). Remove the cap from a 10oz clean plastic bottle. Fill the bottle with a carrier oil that has a thin consistency. Examples are olive oil, jojoba oil and almond oil. Twist off the cap of a bottle of peppermint oil. Tilt the bottle so that its spout is facing the mouth of the plastic bottle containing the carrier oil. Shake the bottle of peppermint oil gently so that it will release about 30 drops into the carrier oil. Screw the cap back onto the bottle of the carrier oil and peppermint oil mixture. Shake this mixture vigorously for 30 seconds. Pour about two to four tablespoons of this mixture into your palm. How much oil is required depends on the length of hair. Thoroughly massage the oil into the scalp as well as the hair. Leave the oil in your hair for at least 30 minutes. Rinse the oil out of your hair using warm water. Follow this step with a shampoo if you want to avoid having oily hair. Remove the lid from the bottle of shampoo that you use each day. Tilting the peppermint oil bottle so that it is facing the mouth of the shampoo bottle, shake out about 20 drops into your shampoo. Place the lid back on the bottle of your shampoo. Shake the bottle for about 40 seconds. Apply your shampoo as you normally do. Because of the menthol in peppermint essential oil, you can use it as a sinus decongestant to treat seasonal allergy symptoms, colds and sinus infections. The oil works by breaking up mucus that is stuck in the sinus passages. Menthol acts as an expectorant, thinning out mucus and allowing it to pass through the sinus passages more easily (source). Remove the cap from your bottle of peppermint essential oil. Position the bottle of oil directly below your nose. The spout of the bottle should be placed directly below the opening of one nostril. Take several deep breaths through your nose. Continue to do this until you feel your sinuses begin to open up. Skin on the scalp is very sensitive to things like dry weather, harsh temperatures and certain chemicals that are found in commercial hair care products. 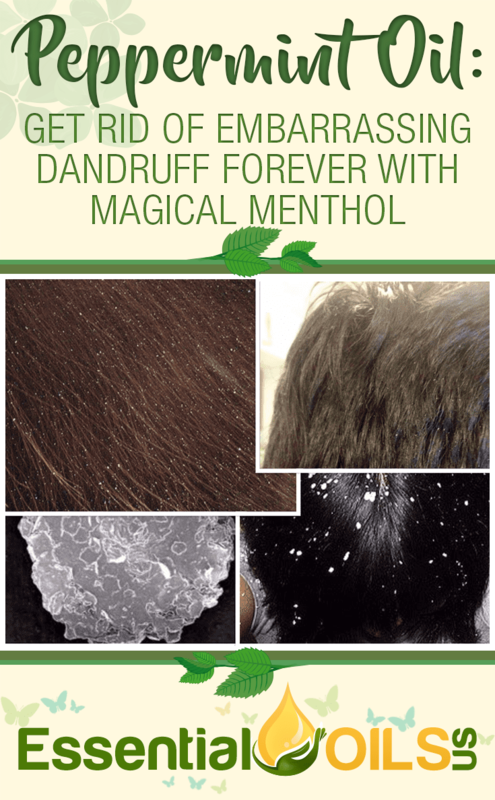 Therefore, the scalp is prone to flakiness and dryness which can result in embarrassing dandruff. Peppermint essential oil is frequently used in hair care products for its cleansing abilities as well as its ability to balance the pH level of the scalp. When the pH balance of the scalp is adjusted, the skin will be soft and healthy instead of dry and flaky (source). Remove the lid from your favorite shampoo bottle. Tilt the bottle of peppermint oil so that its mouth is facing the mouth of the shampoo bottle. Lightly shake the bottle of peppermint oil so that about 30 drops fall into your shampoo. Place the lid back onto the bottle of shampoo. Shake the bottle for about 30 seconds. Shampoo as you normally do. Thanks to menthol, peppermint essential oil can bring down a fever by cooling down the body. Once peppermint essential is applied to the skin, it gets absorbed into the muscles and helps reduce the overall temperature of the body (source). Remove the cap from a clean 20oz plastic bottle. Fill this bottle with a carrier oil that is known for its thin consistency such as jojoba oil or sweet almond oil. Remove the cap from a bottle of peppermint oil. Tilt the bottle at an angle so that its spout is directly above the bottle containing the carrier oil. Shake the bottle of peppermint oil, releasing about 50-60 drops into the carrier oil. Screw the cap back onto the bottle containing the two oils and shake it with vigor for about 60 seconds. Pour this mixture into your palm, a few tablespoons at a time. Rub your palms together and massage the oil into a section of the body until it has fully been absorbed. Continue this process until the oil has been massaged into the skin of every section of the body. The person who is suffering from the fever should feel a cooling sensation within about five minutes. Because of its antibacterial and anti-inflammatory properties, peppermint essential oil is an effective treatment for acne. Pimples contain bacteria that can spread on the face, resulting in more breakouts. By applying peppermint essential oil to pimples, you can kill the bacteria and reduce the chance of having another breakout. 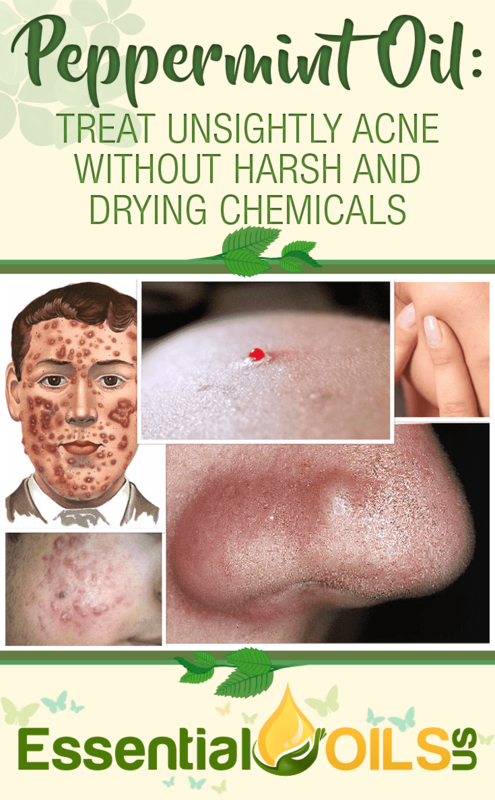 This oil will also tone down skin inflammation that is common with acne. As the pimples swell with blood and pus, the face can become red, inflamed and sensitive. By applying peppermint essential oil to the face, the skin will calm down and decrease in redness. Turn the bottle of oil upside down so that the mouth is directly facing your palm. Carefully tap the side of the bottle with your finger to release one or two drops of oil into your palm. Using your index finger, dab the oil that’s in your palm and then dab the oil with your finger onto each pimple. You may do this twice daily until the pimples are gone. 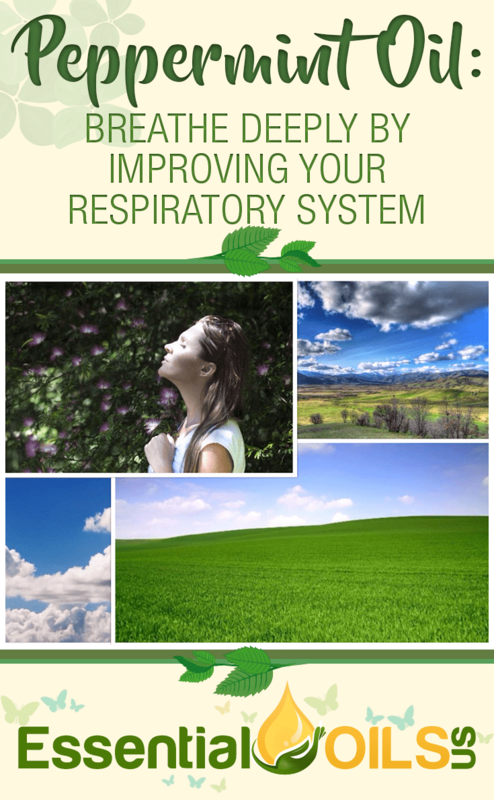 Extensive studies have documented the healing abilities that peppermint essential oil has on the respiratory system. By inhaling menthol, the sinus passages, bronchial tubes and lungs can be soothed and relaxed. Additionally, menthol is capable of thinning out mucus that can cause bronchitis and lung congestion. A study has also shown that by inhaling peppermint essential oil prior to exercise, young men were able to increase their overall respiratory rate (source). Take off the lid of a clean, empty 10oz plastic bottle. Fill the bottle with a carrier oil that has a thin consistency like olive oil or jojoba oil. Twist off the cap of a bottle of peppermint essential oil. Angle the bottle so that its top is facing the mouth of the bottle that contains the carrier oil. Gently shake the bottle of peppermint oil, pouring about 40 drops of it into the carrier oil. Twist the lid back onto the 10oz plastic bottle. Shake it for about 50 seconds. Each day, pour about a tablespoon of this oil mixture into one palm. Rub your two palms together to evenly distribute the oil onto both hands. Then, massage the oil in circular motions onto the skin of your chest. Take several deep breaths in. 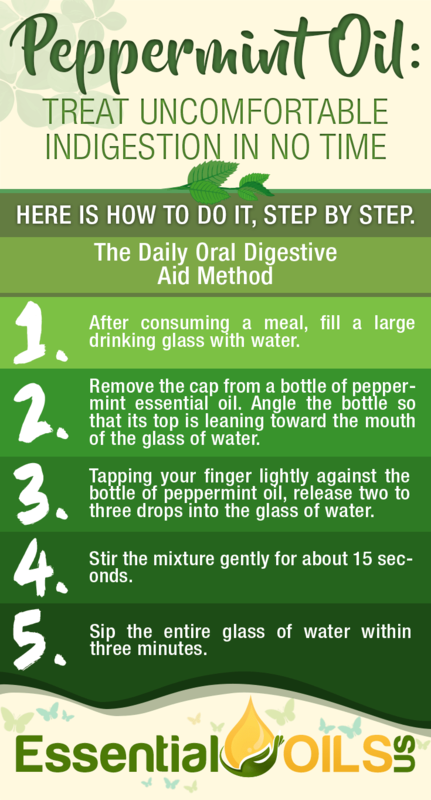 By ingesting peppermint essential oil after finishing a meal, you can help the food digest more easily, preventing painful and uncomfortable indigestion. 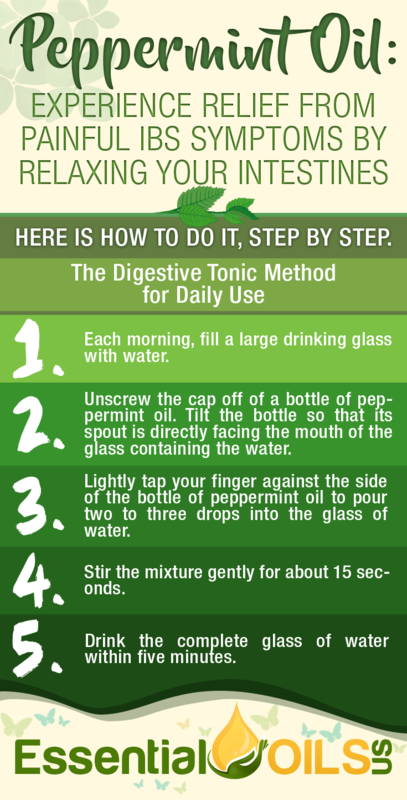 Peppermint essential oil encourages the flow of bile which assists the body in breaking down fats. Therefore, food can flow down the digestive tract more easily without getting stuck in the upper gastrointestinal tract (source). After consuming a meal, fill a large drinking glass with water. Remove the cap from a bottle of peppermint essential oil. Angle the bottle so that its top is leaning toward the mouth of the glass of water. Tapping your finger lightly against the bottle of peppermint oil, release two to three drops into the glass of water. Stir the mixture gently for about 15 seconds. Sip the entire glass of water within three minutes. Studies have shown that by ingesting peppermint essential oil, you can relieve the symptoms that are associated with Irritable Bowel Syndrome (IBS). Symptoms like abdominal pain, gas and bloating can be relieved quickly thanks to the analgesic properties found in menthol that relax the intestinal muscles, allowing food to move more easily along the digestive tract (source). Each morning, fill a large drinking glass with water. Unscrew the cap off of a bottle of peppermint oil. Tilt the bottle so that its spout is directly facing the mouth of the glass containing the water. Lightly tap your finger against the side of the bottle of peppermint oil to pour two to three drops into the glass of water. Drink the complete glass of water within five minutes. Peppermint essential oil is an effective treatment for fungal infections including toenail fungus and yeast infections. The oil’s anti-fungal properties have been shown to kill multiple strains of Candida (source). With one hand, position the bottle upside down over your other palm. Tap the top of the bottle with your finger to allow a couple of drops of oil to be released into your palm. 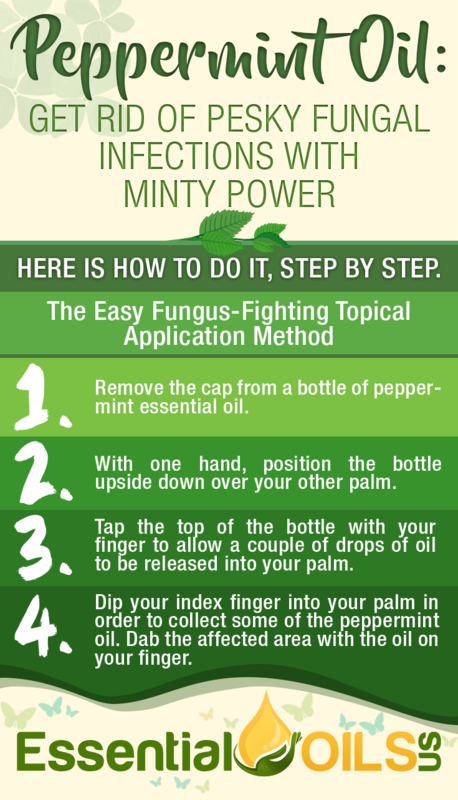 Dip your index finger into your palm in order to collect some of the peppermint oil. Dab the affected area with the oil on your finger. Because of menthol’s numbing effect, peppermint essential oil can provide quick relief to pain caused by sunburns. Simply rub a few drops of this oil directly onto the burn. Take the cap off of a clean and empty 10oz plastic bottle. Fill the bottle with a thin carrier oil like sweet almond oil, jojoba oil or olive oil. Twist off the cap of a bottle of peppermint oil. Angle the peppermint oil bottle so that the top of it is facing the mouth of the plastic bottle containing the carrier oil. Shake the bottle of peppermint oil, allowing it to release about 25 drops into the carrier oil. Screw the cap back onto the bottle of the carrier oil and peppermint oil mixture. Shake the bottle for about 30 seconds. Pour two to four tablespoons of the oil into your palm, depending on the size of the sunburn. Rub your palms together so that there is an even amount of oil on each palm. Thoroughly massage the oil mixture onto the affected area. Continue to massage the oil into the skin until it has fully been absorbed. For decades, science has repeatedly confirmed the positive effects of aromatherapy on mood disorders such as anxiety and clinical depression. By inhaling essential oils, our brain signals the release of chemicals in our brain that make us feel happy and relaxed. Ultimately, aromatherapy is an incredibly quick and effective way to uplift one’s overall mood (source). Peppermint essential oil sends calming signals to the brain, allowing the mind to feel quick relief from stress, anxiety and depression (source). Remove the lid from an oil diffuser. Fill the tank of the oil diffuser with water. Tilt the bottle of peppermint oil so that the top of the bottle is facing the tank of the oil diffuser. Tapping the side of the peppermint oil bottle with your finger, release about five to six drops of oil into the tank of water. Place the oil diffuser in a room that you will be occupying for at least an hour. Plug the diffuser into an outlet near where you will be seated. Turn the oil diffuser on. Try to focus on taking several deep breaths in order to inhale as much of the peppermint oil as possible. Because of peppermint’s antibacterial, antiviral and antimicrobial properties, it makes a fantastic household cleaning solution. All you have to do is combine 50 drops of peppermint essential oil with 3 cups of white vinegar and pour this mixture into a spray bottle. With this household cleaning spray, you will be able to kill germs around your home and keep your house smelling minty fresh. Remove the cap from an empty and clean 20oz spray bottle. Pour three cups of white vinegar into the spray bottle. You may find it easier to do so using a funnel. Position the bottle upside down directly over the mouth of the spray bottle. Shake the bottle of peppermint oil so that it will release 50 drops into the spray bottle. Screw the lid back onto the spray bottle. Shake the bottle with vigor for one minute. Use this spray anywhere around the home. Many studies have shown that by inhaling peppermint essential oil, cognitive brain function is improved as well as memory. The powerful menthol in peppermint stimulates brain activity (source). Take the lid off of your oil diffuser. Twist off the cap of a bottle of peppermint oil. 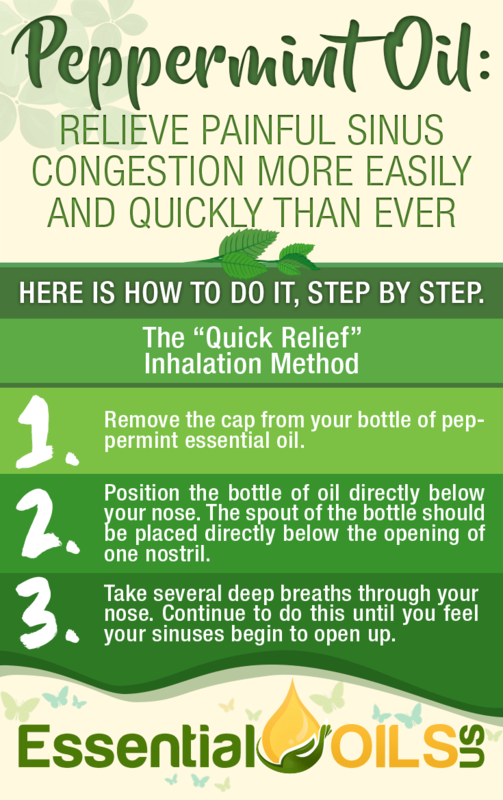 Angle the bottle of peppermint oil so that the mouth of the bottle is facing the tank of the oil diffuser. Carefully pour five or six drops of peppermint oil into the tank by tapping the side of the bottle with one finger. Place the oil diffuser in a room that you will be occupying for at least an hour. Plug the diffuser into an outlet near the area in which you will be seated. Turn the oil diffuser on. Take several deep breaths in order to inhale as much of the peppermint oil as possible. A cross between watermint and spearmint, peppermint is a wild plant that was originally cultivated in the Middle East and some parts of Europe. Today, peppermint is cultivated all over the world. The peppermint plant is known for its ability to grow incredibly quickly (source). Since ancient times, peppermint essential oil has been used as a flavoring agent in foods as well as a medicinal antidote for a variety of problems. Most commonly, peppermint essential oil is used to treat digestive issues as well as headaches. Additionally, peppermint essential oil is known for its powerful antibacterial, anti-fungal and antiviral abilities. Peppermint essential oil is mostly composed of menthol and menthone. It contains antioxidant, antibacterial, anti-fungal, antiviral, anti-inflammatory, antiseptic and analgesic properties within its chemical makeup (source). In order to make pure peppermint essential oil, you need a steam distiller. During the distillation process, steam is pushed through the oils and separated from the plant. Then, the oil is collected. Peppermint essential oil can be made very quickly compared to other essential oils as it only takes a few hours to extract the oils from the peppermint plant (source). For several decades, extensive studies have proven that peppermint essential oil is highly effective in treating numerous ailments. Most studies have been performed to demonstrate peppermint essential oil’s ability to treat digestive disorders, respiratory problems, headaches and sinus congestion (source). Peppermint essential oil is taken in several different ways. For the treatment of headaches, muscle pain and skin conditions, peppermint essential oil can be applied topically to the skin. For adults, it is safe to apply pure peppermint essential oil to the skin. However, keep it away from the eyes to avoid eye irritation. When taken as a digestive aid, peppermint essential oil may be ingested. It can either be ingested by itself or diluted in water or another liquid. Inhaling essential oil can relieve respiratory and sinus problems, headaches and mood disorders. To reap the full benefits of inhaling peppermint essential oil, you can add several drops of it to a hot bath. The steam from the hot water will enhance your ability to inhale it. 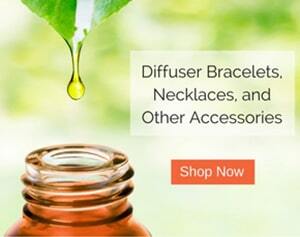 You may also choose to purchase an oil diffuser. This tabletop device combines essential oils with hot water to create steam that will flow throughout whichever room it is in. For children, peppermint essential oil can be applied topically in order to treat a variety of ailments such as congestion, fever and itchy skin. Adults can take peppermint essential oil by applying it topically to the skin, ingesting it and inhaling it. Is Peppermint Essential Oil Safe? Peppermint essential oil has been safely ingested, inhaled and applied to the skin for centuries because of its unique medicinal value. It is suggested that people who have gastrointestinal reflux disease or suffer from a hiatal hernia should avoid ingesting peppermint essential oil as this can aggravate symptoms. Some studies also suggest that diabetics may experience a decrease in blood sugar levels as the result of ingesting peppermint essential oil (source). Peppermint may slow down the liver’s ability to process certain medications (source). Peppermint essential oil is considered likely safe for pregnant women. It is recommended that children under 30 months of age do not use peppermint essential oil. For children under the age of 12, peppermint oil should be diluted when applied topically (source). Where can I buy Peppermint Essential Oil? Because of its popularity, peppermint essential oil can be found in many drug stores and grocery stores. It is very easy to find peppermint essential oil on online retailers like Amazon. There’s no doubt that peppermint essential oil is an incredible and powerful oil that can treat an enormous variety of problems. Its healing abilities combined with its refreshing, minty scent make this essential oil a household must-have. 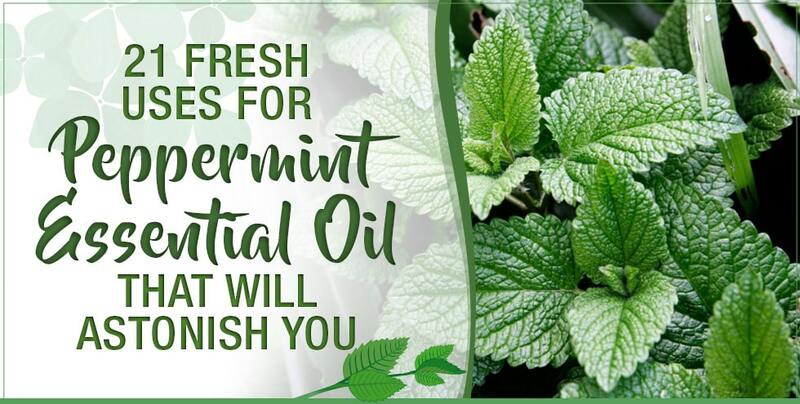 Feel free to share this article with your friends and let us know how you like to use peppermint essential oil in the comments below.